If it is clear in the wee hours before sunrise on February 28, there is no way that you can miss the waning crescent moon and the dazzling planet Venus in the east or southeast sky. 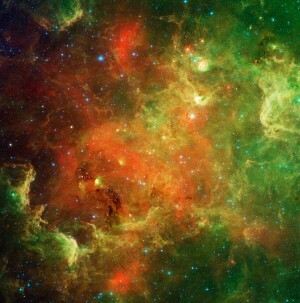 After all, the moon and Venus rank as the second- and third-brightest heavenly bodies, respectively, after the sun. 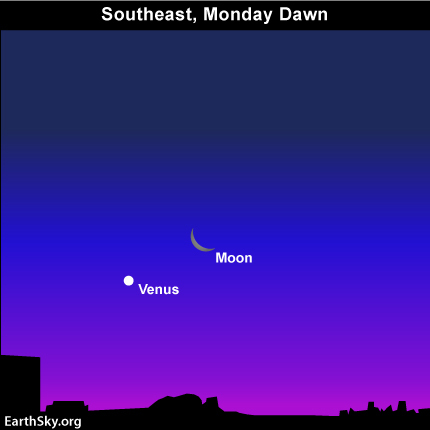 From middle latitudes in the northern hemisphere, the moon and Venus will rise about 2 hours before the sun tomorrow. You cannot miss them if you rise early. As viewed from middle latitudes in the southern hemisphere, the moon and Venus rise well over 3 hours before sunrise. That is because the ecliptic – the pathway of the sun, moon and planets – hits the horizon at a steep angle before sunrise in the southern hemisphere, but at a narrow angle before sunrise in the northern hemisphere. In either the northern or the southern hemisphere, the ecliptic intersects the horizon at a narrow angle on late winter/early spring mornings, but almost perpendicularly on late summer/early autumn mornings. Because it is late winter in the northern hemisphere right now, the ecliptic crosses the horizon at a shallow angle in our morning sky. Meanwhile, the moon’s rotational axis and Venus’ rotational axis – the axis these two worlds spin around – stand almost straight up and down relative to the plane of the ecliptic. That’s in contrast to our Earth, whose rotational axis tilts some 23.5 degrees out of perpendicular to the ecliptic – or the plane of the Earth’s orbital path around the sun. Catch these two “upright” worlds – the moon and Venus – in the dawn and predawn hours on February 28, 2011!